I grew up in a small rural community. So small, we only had one fast-food place that primarily served ice cream and was only open during the summer months. There wasn’t any bakeries, pizza places or burger joints. We survived anyway. I know, I wonder how too. If you wanted something you had to make it. I was born with a primary chocolate gene I am convinced. Prior to my baking days, I remember when I discovered the unsweetened cocoa container in the cupboard. I thought I was really getting away with something in finding it. It smelled amazing. I got out a spoon and dipped in. What the heck? It was awful! What a huge disappointment! This oatmeal sure wasn’t a disappointment. It’s a great way to get your chocolate fix and your antioxidants at the same time. You can control how much sweetness you want with a drizzle of maple or agave syrup, some roasted coconut, or heck get out the sugar bowl, I wont tell. I added some roasted almonds, and it was like dessert before dinner. Another great thing about this oatmeal is that it makes 4 to 6 servings. I just cooked it all up and put it in separate bowls. I had breakfast for the week. Bring milk to a boil in a medium saucepan. 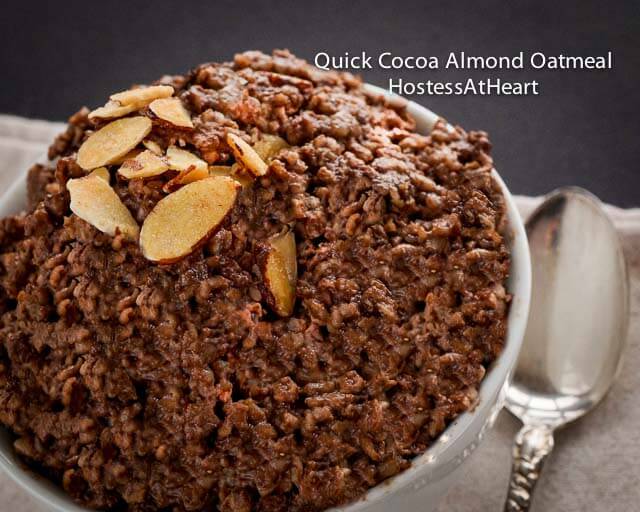 Stir in oats, cocoa powder and salt. Return to a boil, then reduce heat to medium. Cook until thickened, about 2 minutes. Spoon into serving bowls, garnish with almonds, and a drizzle of agave syrup. Now i’m headed over to wake up the Fiesta Friday parties with this wholesome breakfast hosted by the wonderful Angie at The Novice Gardner and co-hosted by the equally grand Selma @Selma’s Table and Sue @birgerbird. I can’t believe I have never even thought of adding chocolate to oatmeal. This looks amazing! I eat oatmeal for breakfast a lot and have to try this. Thanks for sharing it, Julie! Thank you Shari! I hope you enjoy it. Thank you Johanne. I just love starting my day with oatmeal too. 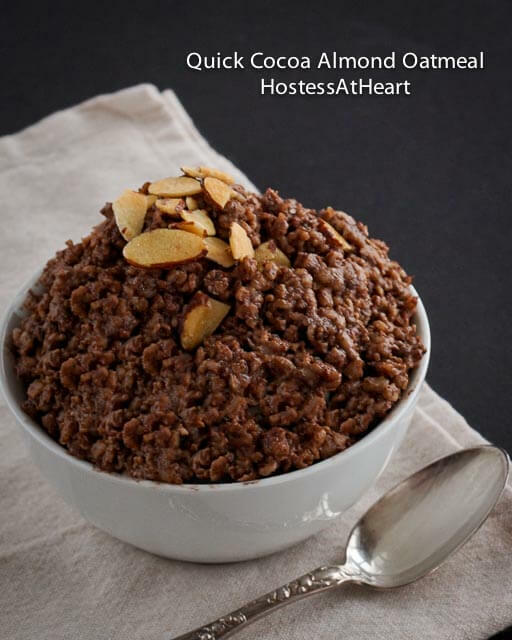 There is something rustic and inviting about this almond oats! I would surely use that spoon to dig into it! Awe thank you. I really enjoyed it. I love chocolate period :). Thanks for visiting! I was just getting so bored with my very mundane oatmeal breakfasts, and was feeling bad about adding chocolate. This recipe will satisfy my chocolate craving without making me feel bad! 😀 yay!! Would love this for breakfast! Perfect! Looks amazing! I am going to try it. I have another one up my sleeve (or in my fridge) too! Stephanie, I couldn’t find the like button or comment button on your blog’s post. I did want to thank you for introducing me to matcha! Thank you Sonal! It was very quick to make. Wow, this looks so good! And healthy too, great recipe! Yes, you might Julie 🙂 I did mean that it was good for me to make, and especially eat, more healthy recipes. I try to throw in a WW recipe every now and then! A very good breakfast recipe. Im sure it will taste amazing just by seeing the ingredients. Thank you again! So sweet of you. Hello lovely Julie!!!! So nice to see you again and welcome to FF #50. This oatmeal does NOT look like oatmeal at all, it looks like a crispy cup of dessert deliciousness! I love your creativity and also your sincere voice in your blog. Looking forward to taking some time today as host to read around your blog and getting to know you better! Thank you Sue! FF is one of my favorite places to be. Everyone is amazing. Thank you for hosting! I could almost imagine how delicious is this and very easy to follow. I hope I have a bowl of this right now. Besides, I love breakfast foods anytime. 🙂 Happy FF, Julie. Hugs! This is very interesting. I love that you have used almond milk. An easy and delicious treat! Thank you! 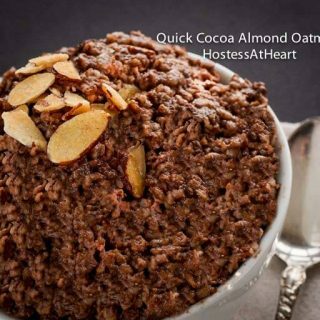 I use almond milk most of the time with my oatmeal and think it worked well with this recipe. Thank you for stopping by! I’ve started editing them with a free trial from Lightroom. It gives you an option to add text. What are you using for your photos? It does look great Julie, your free trial with the text. I have never tried any out there, I guess I just stick with my iPhoto that comes with the Mac. Oh. My. Word! This looks delicious! I’m trying to cut back on the sweets. This is a great substitute that looks so healthy! I think I might be making this for a snack tonight or for breakfast this weekend! Thank you! It makes quite a bit so 4 servings are large and filling. I didn’t see your email? I’m current. Can you send it again? [email protected].